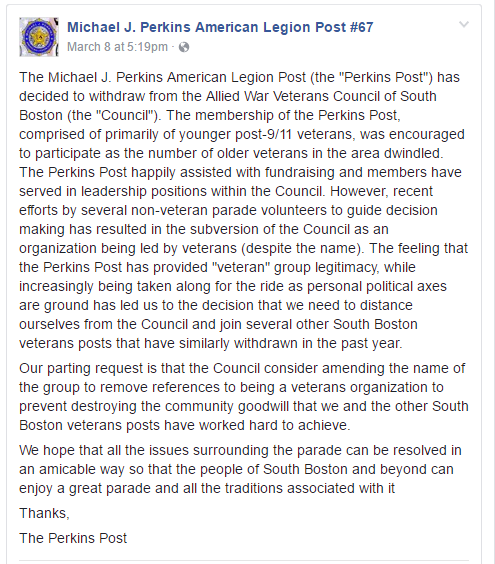 UPDATE: The council has reversed it's decision and OutVets will be allowed to march in the 115 year old South Boston Allied War Veterans Council St. Patrick's Day parade. It appears there may be problems within the Veteran's Council though. The screen capture below is from the Facebook page of a group that has withdrawn from the council. 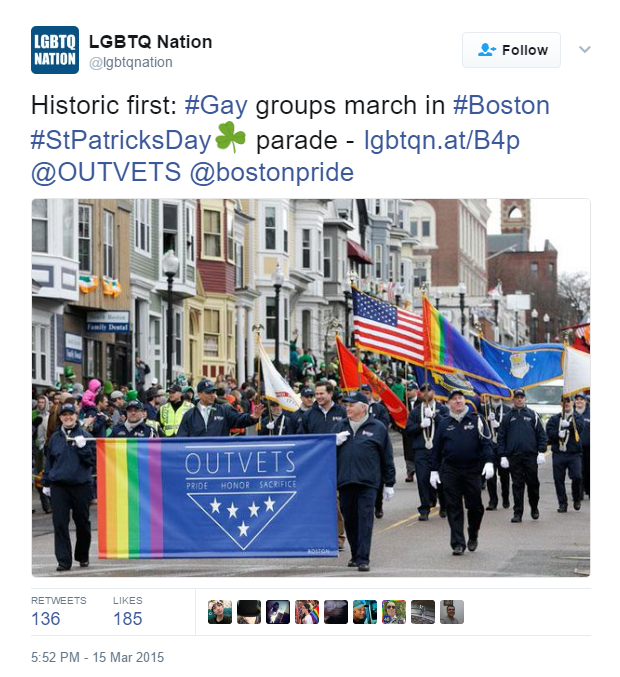 Two years ago, history was made in Boston when OutVets, an organization composed of Gay veterans, was invited to march in the 2015 St. Patrick's Day parade put on by the South Boston Allied War Veterans Council. That invitation came after a lawsuit was filed 25 years ago by a gay veterans group who were denied the right to march in the 115 year old parade. The lawsuit made it all the way to the Supreme Court which determined the parade organizers had the right to decide who marched in their parade. 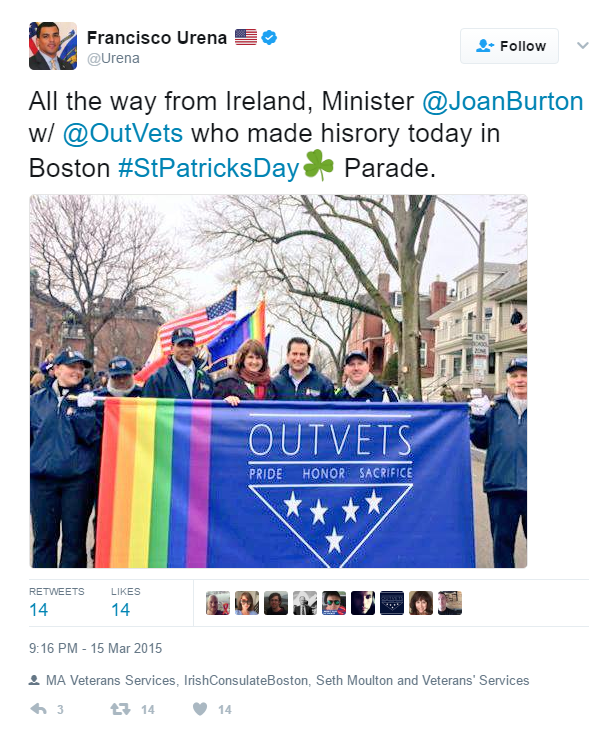 But organizers had a change of heart in 2015 and OutVets was allowed to be part of the parade. They were invited again in 2016. But this year OutVets was denied participation in the parade. 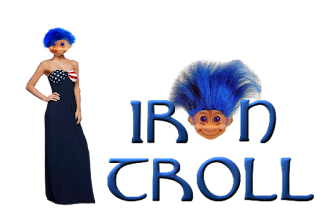 The reason given for the ban is because the group's logo contains a rainbow which the committee felt is too associated with Gayness. They determined this somehow violated one of their rules. The rule specifically applies to "sexual orientation" which is a politically correct way to avoid coming out and saying Gay. 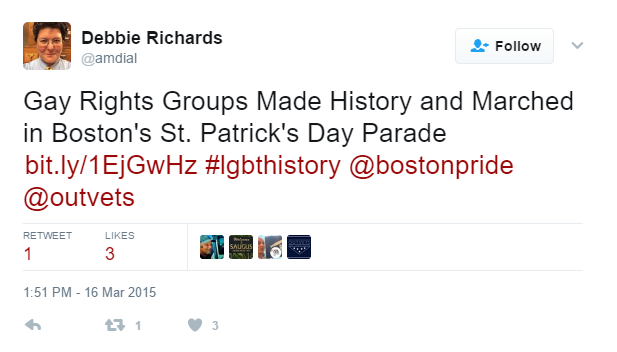 If you look at the rule below it's hard to see how a rainbow logo could be misconstrued to be a theme of a St. Patrick's day parade. Actually, a rainbow is considered part of Irish folklore so any display of a rainbow would fit in with St Patty's day so the excuse is a bit weak. It's disappointing to see anyone discriminated against because of their sexuality but totally outrageous to see it done to a group of veterans by a group of veterans. The current president seems to have made America intolerant again. Also amazing to see this happen in Boston for St. Patrick's Day. Irish immigrants were once discriminated against and it was war veterans, Irishmen who fought in the Civil War, that helped change the bigotry. The South Boston Allied War Veterans Council even mention this on their website. I guess they haven't read their own pages lately. The decision by the SBAWVC organizing committee has not been a popular one. The parade's Grand Marshall resigned and the Mayor has decided he won't march in the parade. 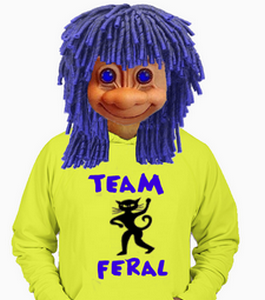 The committee is meeting today, Friday, to think over their silly decision. They'll probably overturn it but they themselves have managed to "deter from the basis of which this Parade has been celebrated historically. " The committee organizers have made their parade a Gay issue all by themselves. OutVets have a Twitter account but it's not active, you can show them some love on Facebook. 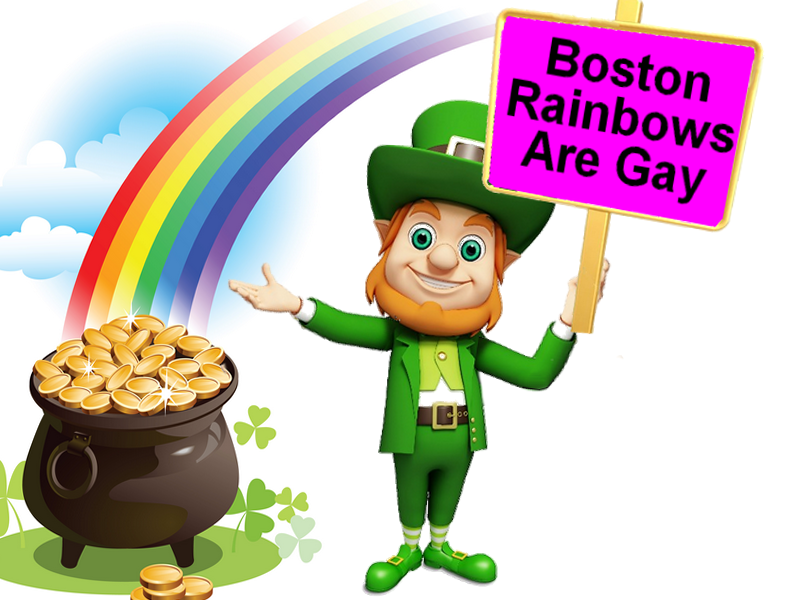 And if you'll be attending the SBAWVC St Patrick's Day parade, bring a little rainbow flag to wave.